November 12, 2015, 9:02 a.m. The facts on gender inequality from around the world are stark. Women earn 33% less than men and are concentrated in jobs with poor working conditions; 700 million women are victims of physical and/or sexual violence each year, often in close relationships; men own and manage just under 70% of all businesses and women sit on only 19% of board seats globally; and two thirds of the 774 million illiterate adults worldwide are female. The facts paint a clear picture of continuing gender inequality worldwide, but changes in attitudes reveal the economic and social progress that is slowly being made. For the first time YouGov has collated public opinion data on gender equality from 24 countries worldwide, revealing the countries with the most progressive attitudes to gender equality and where the challenge is most acute. We asked 14 questions in total – 10 of which are statements about gender equality requiring an agree/disagree response. Four represent views about gender roles that would be considered conservative, such as &apos;it is unattractive for women to express strong opinions in public&apos;, and six represent views that would be considered progressive in relation to the conservative statements, such as &apos;creating more opportunity for women should be one of the world&apos;s top concerns&apos; and &apos;women and men should generally get equal pay&apos;. 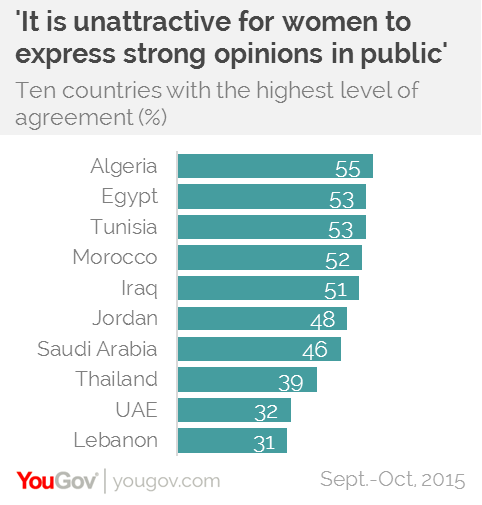 The ranking below is based on an aggregation of the net responses to all ten statements for each country. The Nordic countries generally outperform the rest of the world, which is no coincidence – in the World Economic Forum&apos;s Global Gender Gap Index, which measures gender inequalities in health, education, economics and politics, the Nordic countries have the highest levels of equality worldwide. Not only do Swedish people have the most progressive attitudes to gender equality worldwide, there is virtually no gap between the views of men and women. 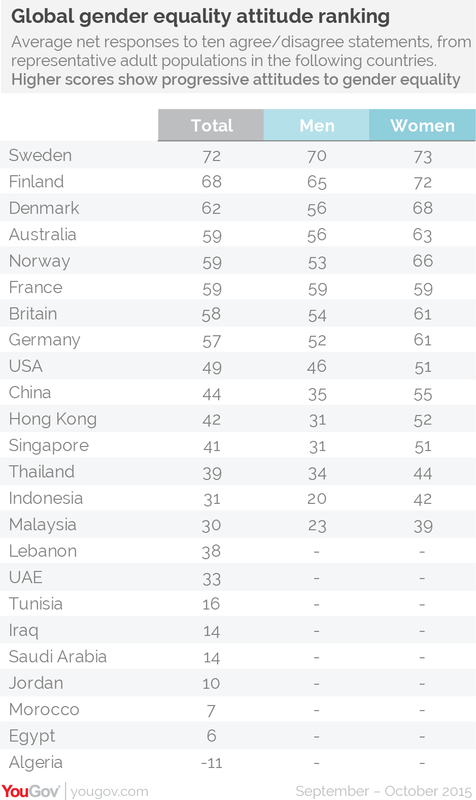 In Asian countries like China, Hong Kong and Singapore there is a 20-21 point difference between male and female attitudes. Due to smaller sample sizes in the Middle Eastern countries data for individual genders is unavailable. Britain misses out on the top quartile by one point, placing with Germany at the tail end of the European countries but 9 points ahead of the remaining Western nation – the US. The Middle Eastern states are the most conservative, and on three statements there is more than a 60 point difference between the Middle East average and global average – &apos;a wife&apos;s first role is to look after her husband&apos; (on average 74% agree in the Middle East), &apos;a woman&apos;s place is in the home&apos; (54%) and &apos;it is unattractive for women to express strong opinions in public&apos; (48%). As can be seen in the chart below, there is a significant relationships between a country&apos;s attitude to gender equality and its GDP per capita. 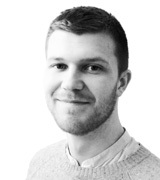 But there are notable exceptions – most obviously in the US. America has over seven times as much wealth per person as China, however it scores only five points higher in progressiveness. Saudi Arabia has considerably more wealth than many countries with similarly conservative outlooks, while relative to their low levels of GDP per person, China, Thailand and Lebanon are highly progressive. According to the Global Gender Gap Index Britain has a higher level of gender inequality than the other developed countries surveyed, yet Britain has more progressive attitudes than them in a number of key areas. Ranked from most progressive to least progressive, relative to the average for highly developed countries (&apos;highly developed&apos; defined as being in the top quartile of countries in the Human Development Index), the chart below shows the British public&apos;s responses to the ten attitude statements used in the research. On the four conservative statements, Britain is firmly ahead of the average for highly developed countries, while the average for less developed countries is well below. There are two attitudes in which Britain falls behind. The net score for highly developed countries (which includes countries which rank lower in progressiveness, like Saudi Arabia and the UAE) on &apos;in the world as a whole, women are an oppressed group&apos; is +30, however in Britain it is lower, at +21. And on &apos;creating more opportunity for women should be one of the world&apos;s top concerns&apos; the developed average is +45, while in Britain is 23 points lower, at +22 – and is even 6 points lower than the average for less developed countries. 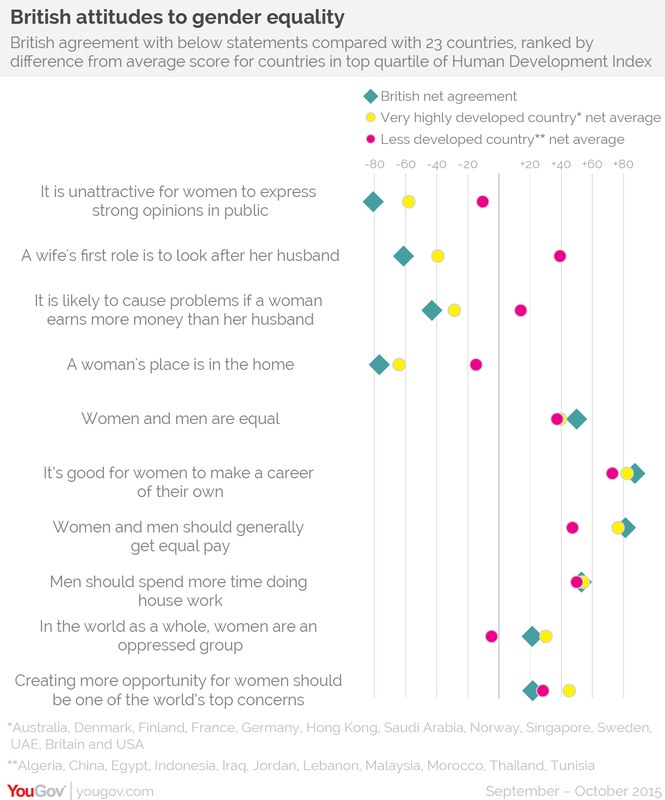 On this last attitude Britain only has a higher score than Morocco, Jordan, Thailand and Algeria, suggesting that while Britain has a fundamentally progressive outlook to traditional gender roles around the home and in society, the issue is not thought of as such a high priority as it is in other developed countries, either for at home or abroad.